Children hold Kyrgyzstan and Chinese national flags and flowers at a welcome ceremony for visiting Kyrgyzstan President Sooronbay Jeenbekov held outside the Great Hall of the People in Beijing, Wednesday, June 6, 2018. On December 20, a crowd of about 150 people gathered near the Chinese Embassy in Bishkek for a protest. Security didn’t allow the protesters to approach the embassy, but the crowd — made up of mostly young men — huddled in the snow to listen to the demands of Kyrk Choro leaders. 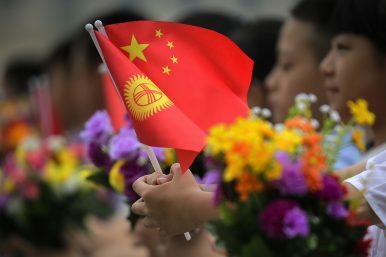 The Kyrgyz nationalist group has called on the Chinese government to explain why it has arrested ethnic Kyrgyz and is holding them in internment camps; they also demanded that the Kyrgyz government expel any Chinese found to be staying in the country illegally. Zamirbek Kochorbaev, a leader of Kyrk Choro, warned that Kyrgyz authorities have 30 days to comply, after which Kyrk Choro will take it upon themselves to go to the offices of foreign companies and check the legal status of employees themselves. Kochorbaev also suggested the creation of a committee that would check the documents of all foreigners living in Kyrgyzstan, including those who have received citizenship in the last 10 years. This call to investigate foreigners’ documents comes days after Kyrgyzstan’s government published data about Chinese citizens currently living in the country. According to the figures, in 2018 35,215 Chinese citizens came to Kyrgyzstan, many of whom are construction workers on various projects funded through the Belt and Road Initiative (BRI). From 2010 to 2018, 268 people from China received Kyrgyz citizenship. The irony of Kyrk Choro’s clamoring about the legality of those getting Kyrgyz citizenship from China is that the majority are co-ethnics; of the 268 people who received citizenship since 2010, only six are Han Chinese while the vast majority — 171 people — are ethnic Kyrgyz. Some of these people came to Kyrgyzstan through the “Kairylman” program, which launched in 2006 with the goal of encouraging ethnic Kyrgyz to resettle in their ancestral homeland. Between 150,000-200,000 ethnic Kyrgyz live in China, mostly in Kizilsu prefecture in western Xinjiang. Jeenbekov’s caution contrasts sharply with the vocal passion of citizen activists in Bishkek, reflective of a necessary political calculus involved in maintaining good relations with China, which is a significant trade partner and supplier of aid. That trade and aid could be a source of the backlash, however. It appears that digital campaigns to shed light on the internment camps in Xinjiang are being linked with criticism of Chinese economic development projects and soft power initiatives. One widely-shared image, which declares “Don’t let anyone take your land,” depicts a strong fist — adorned with a Kyrgyz flag — stopping a spindly hand — marked by a Chinese flag — from snatching factories and a field. Some see loans and investment from the BRI as predatory, reminiscent of the controversial Sino-Kyrgyz border demarcation process that involved Kyrgyzstan handing over 1,250 square kilometers of land to China in 2002. Other social media accounts have linked frustration with Chinese economic development projects and concerns about the abuse of Muslims in China. A Facebook page with 4,500 followers called “Kytai baskynchylygyna karshybyz” (“We’re against Chinese aggression”) posted a news article about Chinese mining companies operating in Kyrgyzstan immediately after an article depicting a civilian homestay surveillance program in Xinjiang. The feed of an Instagram account simply called “stop_kytai” (“stop_china”) features a similar balance of news updates about the internment camps in western China with xenophobic content about Chinese culinary practices. It is certainly misguided to link the injustices of detaining more than a million people in internment camps with sensationalist Sinophobic news items, but this discursive pattern is revealing. It suggests that this month’s protests in Bishkek are building on a wider base of grievances than just the human rights concerns for co-ethnics across the border. More demonstrations are planned for coming weeks, and it remains to be seen how these other grievances will shape the form and content of future protest.